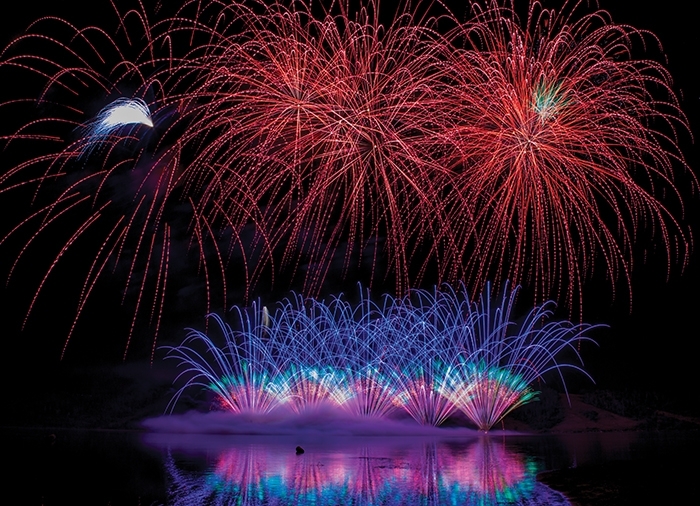 August 4 and 5—this Saturday and Sunday—will be the ninth annual Living Skies Come Alive Fireworks competition. Fireworks are shot off across Moosomin Lake from the main beach in the annual competition. Editor Kevin Weedmark sat down with Layne McFarlane and Laurie Renneberg of the fireworks committee to find out more about this year’s show. How is the fireworks weekend coming together? Laurie: It is coming along great. Layne: I would say we have had more committee meetings than ever before, we have done more planning to try to make it better than ever before. We are encouraging people to take the bus to avoid the traffic congestion. Have you added bus capacity? Layne: Yes, there will be two buses running and if there is enough demand then they’ll make two trips with each bus. It’s perfect for people that don’t want to do a lot of walking because it goes right down to the beach, they pick everyone up right at the store and take you home, so it is a totally hassle free way to come to the fireworks. The cost is $30 and that includes your bus ticket and entry into the park. Laurie: We just encourage people to give Taylor Charters a call if they are interested. There were long lineups for food last year—do you have more food booths this year? Laurie: Yes, there will be six including the store. We’ve got wraps, burgers, hot dogs, mini doughnuts, cotton candy, ice cream treats, butter chicken, pizza, and Tim Hortons will be there again. Layne: There’s lots of variety and more booths than ever before. Laurie: The food booths will be open from 11 am-9 pm. They are all going to be set up in one place this year across from the store in the grassy area so it will be easy to get to, and picnic tables will be there for everyone to sit down and enjoy. Are you expecting similar crowds to last year? Laurie: It’s hard to tell. China was just such a big draw for everybody. I think people really wanted to see what they could bring and it was a huge success. We are hoping U.S.A. will bring a lot of people out as well. The company coming is one of the top six in 10 companies in the United States. Layne: I was actually talking to them this morning. Our Canadian competitor says he has spent a significant amount of money to improve the quality of his show, and our American competitor has been in business for 34 years, has done the fireworks for a Super Bowl and the World Cup opening ceremonies. They are bringing in aspects of the show from different countries including Spain, China, and Japan. Every country or area has a different sort of an aspect on how they shoot off their pyrotechnics and design and the choreography of the show, and they are bringing all of that to Moosomin. I truly believe this is going to be the biggest and best show ever. People should not miss this show. Laurie: There will be pancake breakfasts both mornings, a sand castle building contest for the kids from 11-12 on Saturday, kids games both days, pontoon boat rides both days, a Sask Express show 4-4:45 pm each day, a beef dip supper both days, beer gardens of course, the two bands Shifty Morgan on the Saturday and Stuck on Red on Sunday, and then the 50/50 draw is always a big one, so a minimum $500 each day. Layne: We are attempting to make it a truly family entertainment event, and I had a fellow a few years ago that helped me with traffic control. He said he was sitting there out on the beach and kids were running around with lighted bracelets and you could tell there were the moms and dads and grandparents, and he said ‘what a phenomenal event to have a totally family event.’ And I’ve had others say it is a different environment than Craven and Dauphin—this is a different type of atmosphere—this is a family event. Laurie: We just really encourage people to come early and enjoy the day and get parking early. Don’t wait until 9:30 pm to show up. Laurie: We see the majority of people coming at 6-6:30 pm. Layne: 6:30-9:30 pm has been the peak period of time for people coming in. But we’re really optimistic that bringing in other shows such as Sask Express earlier will encourage people to come earlier. We hope people will come early and enjoy the entire event. The earlier you can come the better, because we can guarantee the earlier you bring your car out the quicker you are going to get out after the show. We will have transportation to take people down from the parking to the beach, as we’ve had in the past. You had a success last year with 12,500 people through the gates. What would be your grand total that you’ve raised from this event over the years? Laurie: About $300,000 in total. That’s helped us build our water treatment plant for the park. That was $600,000 so this has helped a lot. Layne: The new plant is coming together and the quality of the water is working fine, and together with the engineers and the trades people, they’re getting the little quirks worked out of the new plant, and so overall we’re very pleased. What sort of people come out to this event? Laurie: People from everywhere. There are quite a few families that get together every year. We’ve had people from the United States, from B.C., from Manitoba. It’s growing and it’s hard to pinpoint them. We are doing a little bit of research this year to find out postal codes when they are buying their tickets so we can get a better handle on where people are coming from. Do you have a lot of annual visitors that come back year after year? Layne: A couple of years ago I walked through the campers and just visited with people along the way and I remember one camper in particular. They were from Wolseley and they stayed four or five years ago for one night and saw the fireworks, and since then they have come for the entire weekend. They bring the camper and enjoy the entire August long weekend. It has become somewhat of a destination for many people and an annual event for many of them. What is the history of this event? How did it get going? Laurie: A few guys got together on the beach and bought some fireworks, and it kind of started from there and then it just grew every year. Layne: It has grown each year. There has been a general philosophy that it can’t stay the same, we’ve got to try to improve it every year, and we believe we have done that. Where we go from here when we believe this is the greatest show on earth, I’m not sure, but we are really excited about this year. Why do you guys put the work you do into this event? Laurie: Because we love the park. We had a meeting the other night and somebody was outside saying that they had been to different regional parks in Saskatchewan, and ours was just so awesome. You hear comments from people all the time about what a nice park it is, and we go travelling quite a bit to different campgrounds and we see what a gem we have here in the corner of the province, and I think that’s why we do it—because we love our park and want to keep it nice. And by raising funds we’re able to keep it going. Layne: It’s a public park and we are proud of it, and when we work with an event, we want it to be successful, and so we’re doing everything we can to make it successful. Laurie: Without the support of the businesses in town, without their donations and their support, we definitely couldn’t. We’re so happy with the support from the businesses, and from the Chamber of Commerce which nominated us for the provincial tourism awards for community event of the year. Sometimes it’s not monetary donations, it’s donations in kind, like from the RCMP, Fire Department, Hutch Ambulance, those people that don’t have to be out there but are there because we need them for that weekend. We do appreciate them, and a lot of businesses like yourself give us a cut on different products or services, so that helps us out as well. If there is anyone out there who would still like to donate towards our worthy weekend, it would be greatly appreciated. Do you get a lot of people for the sand castle building and kids games, those daytime events? Laurie: Yes, last year I had to run in and buy more prizes for the kids—we had over 100 kids each day and it was just crazy. For the sand castle building, the beach is full of kids and their families. It’s a family event. Everyone is out there with their pails. I bet you there are 20-30 different families out there building sand castles, and Lynn from Re/Max Realty looks after the whole event, and there are prizes, and everyone who is there gets a prize or some sort of treat. Do you get a lot of people for the pontoon boat rides? Laurie: Definitely. They are about half an hour ride. It is amazing how many people have never been on water before. Those are the people who truly appreciate the cabin owners taking time out of their busy weekend and giving those rides. Layne: It’s sort of a unique perspective just riding down the lake. It is different than driving down the road. Laurie: You don’t appreciate the magnitude of what our park has to offer by driving down the road—it looks very different from the water! You’ve been growing each year and you had an amazing turnout last year, with 12,500 people through the gates. What are your expectations for this year? Layne: It’s so hard to tell, but we have limited the tickets this year to 7,000 per night. Laurie: People might want to get their advance tickets by July 28. Layne: The advance tickets are $15 and at the toll gate they are $20, so it pays to get advance tickets. There is also a limited amount of parking. I think we’ve maxed it out at 350. The camping is certainly getting filled up. We certainly hope that we have mother nature’s support once again. Laurie: We’ve always been lucky with the weather, and hopefully it’s good again.